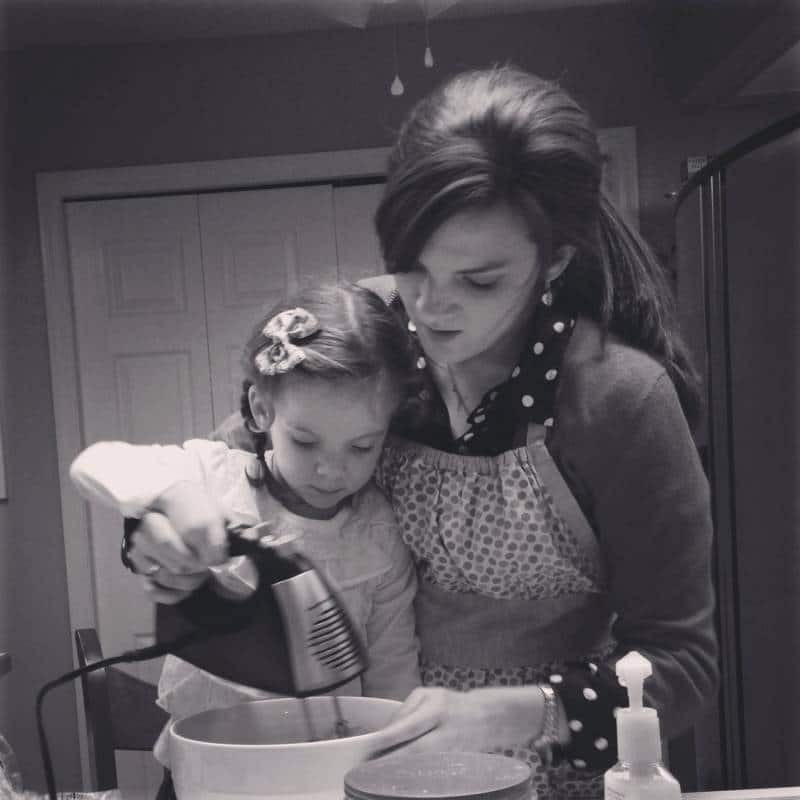 This post is part of the new “Cooking with Kids” Series on Pint-sized Treasures! 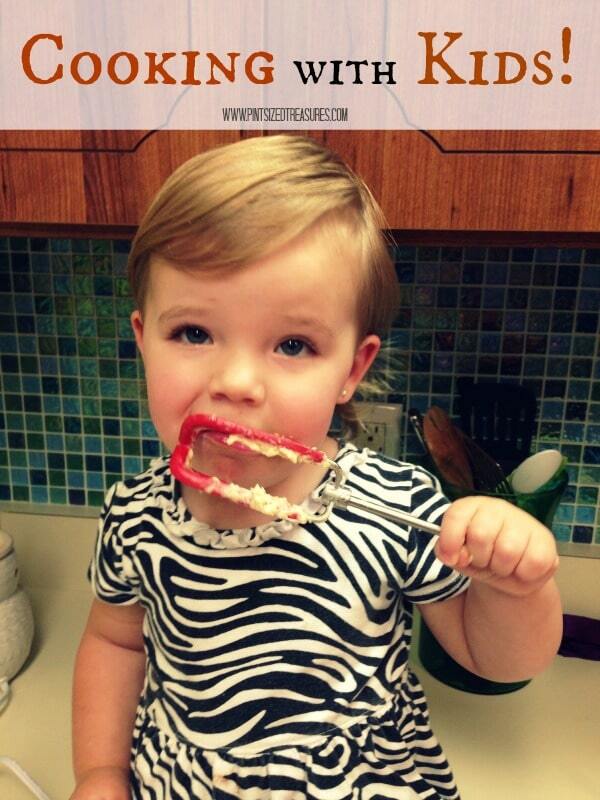 Cooking with children can be such a fun and educational experience. When Riley, Caroline, and I make our favorite cookies, there are so many opportunities to expand their vocabularies and discuss math concepts. We count cups of flour, look at numbers on the mixer or microwave, and talk about the ingredients we are using. The kitchen is an ideal place for kids to explore with their senses, too. There are sounds coming from appliances, aromas wafting up from the pot on the stove, and tastes to be enjoyed at the end of the project. As you’re working, be sure to talk to your little chef about what’s going on around him. Encourage him to touch the flour (with clean hands, of course), listen to the hum of the mixer, and taste the chocolate chips before they’re poured in. 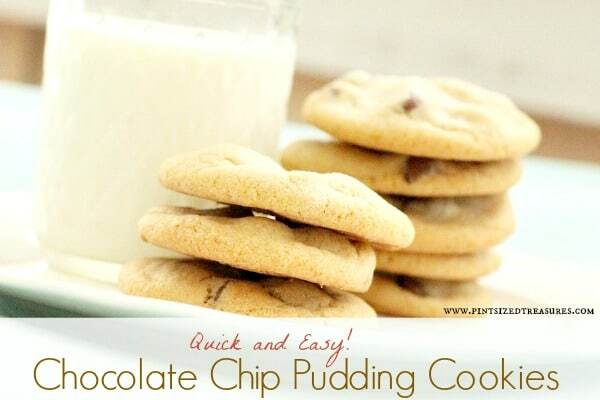 Speaking of our favorite cookies, these chocolate chip pudding cookies are quick and easy to make with your kids. In a large bowl, cream together butter, white, and brown sugar. Mix in eggs, pudding powder, and vanilla. Combine baking soda, salt, and flour in a separate bowl. Mix into wet ingredients. Add flour until the mixture isn’t sticking to the sides of the bowl. Fold in chocolate chips. Roll into balls and place on an ungreased baking pan and bake for 9-11 minute (10 is perfect in my oven) or until the cookies are a light golden brown. The batch makes approximately 48 cookies (but this depends on how much dough you eat…not that we eat any cookie dough).